If you are on my mailing list, you’ve seen this card with my last newsletter but I love it so much that I had to share it on my blog too! I started out by picking two of the patterns from the Sale-a-Bration designer paper Everyday Enchantment. I guess, I thought this evoked a garden window at the time. Then I started stamping some flowers from the Vintage Vogue stamp set and cut them out by hand. Not the fastest process, but actually pretty relaxing. Then I started layering my elements by popping up the green piece of designer paper and layering flowers above and below the level of that paper. 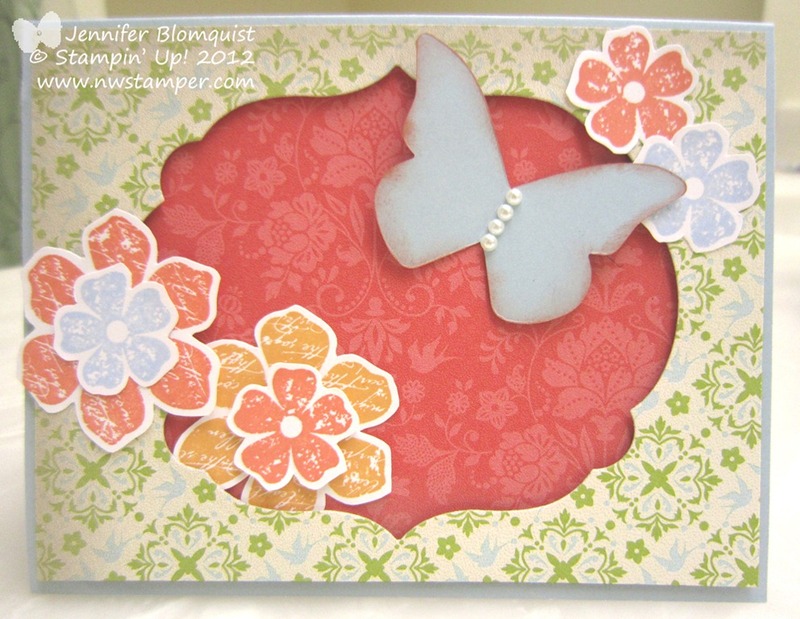 Finally, I finished it off with butterfly from the Beautiful Butterflies dies to make my garden complete! Don’t miss out on Sale-a-Bration – see what you can get FREE with your order! I saw a layout by a crafty friend of mine named Brettaney Q, who is a super talented scrapbooker, and was inspired to scraplift from it for the show this coming weekend. She was so nice to give me permission and I love how my version turned out thanks to her inspiration. I changed things up because I was using all Stampin’ Up! supplies and it was fun to get to pull out and play with all my tools! This layout ended up being all about texture as I cut my strips for the color-blocked bottom of the layout and ran them through my Big Shot using the Perfect Polka Dots embossing folder. And on the top half of the layout I stamped with the Mixed Bunch stamp set with Versamark and embossed using clear embossing powder. I added some Wisteria Wonder bakers twine along the middle which softens it all a bit. 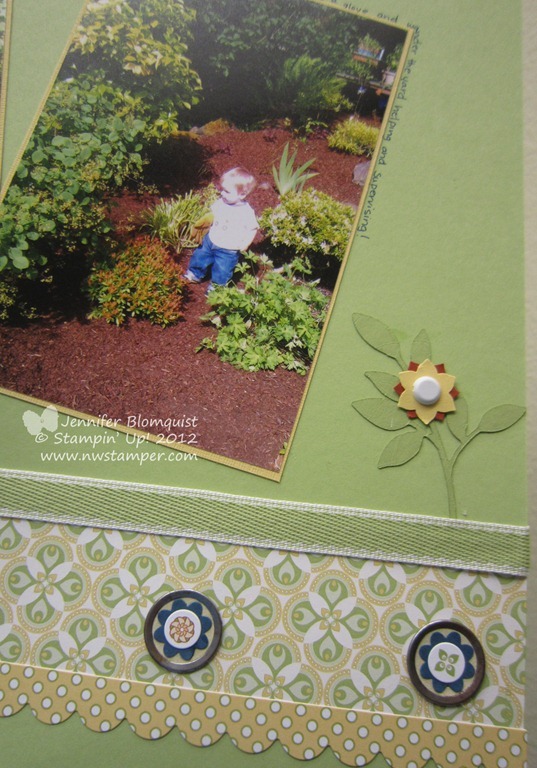 And then I played with my Mixed Bunch stamp set and the matching Blossom punch to make the flower next to my photo. Oh, and the last thing I did was add a simple title to my page. I again reached for my Big Shot and grabbed my Timeless Type alphabet sizzlets, and cut it out of Rich Razzleberry cardstock. I’ll be demo’ing for about 30 minutes and have a display table next to the stage with more samples, information, and of course a show special! I still have a lot to do but I think the show will be a lot of fun. Hope you can come say hello if you are local! 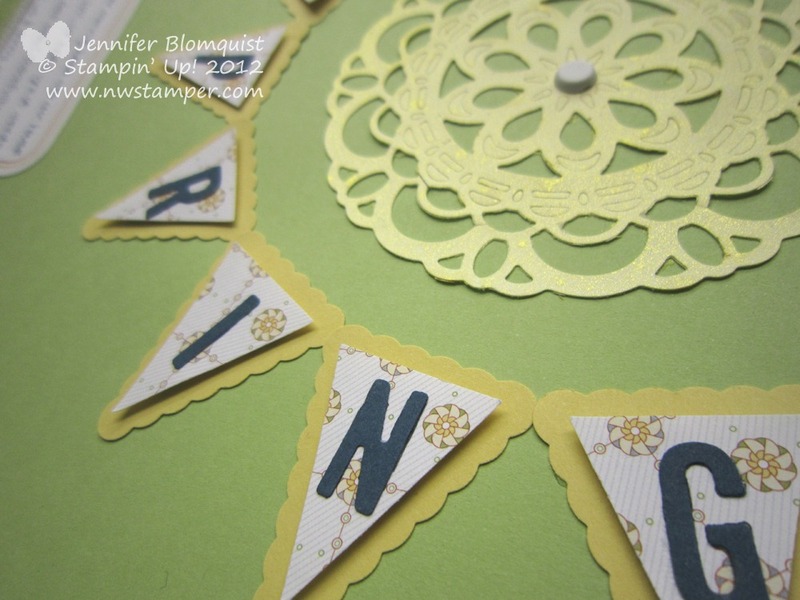 Sometimes a simple card with a pop of color and a cool focal element is all you need. 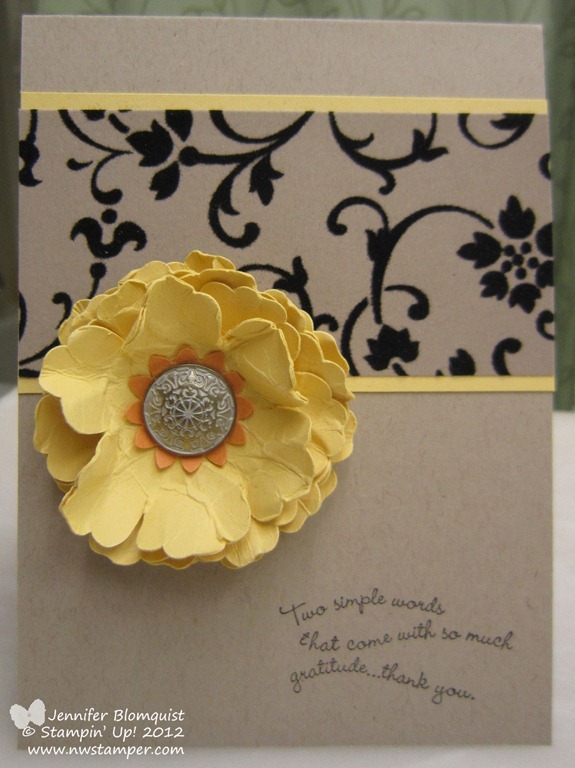 In this case, the Daffodil Delight cardstock and the punched flower gives it that. To create the flower, we punched the new Blossom punch five times. For each punched flower, I crinkled up the paper as much as I could and then adhered them together. 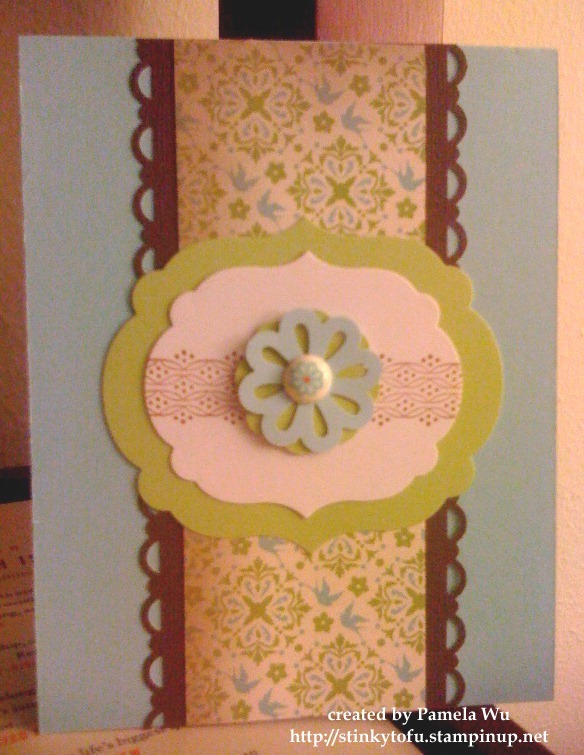 I added a small Peach Parfait Boho Blossom punch out for the center before pulling it all together with an antique brad. The one other thing that you can’t see, but I love is that the designer paper is flocked, adding a bit more of a rich feel to the card without being over the top. Want to make this card yourself? 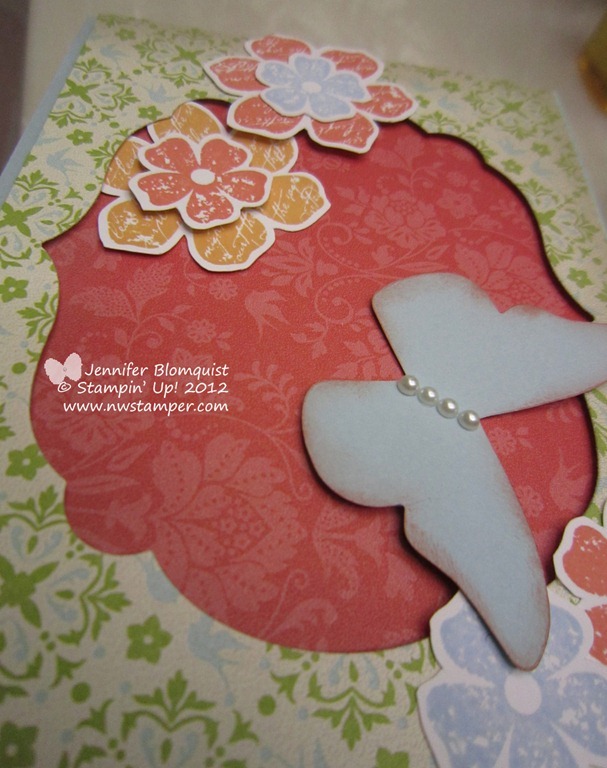 It is one of the cards featured in this month’s Cards To Go kit! Get all the supplies to make it at home mailed straight to you. 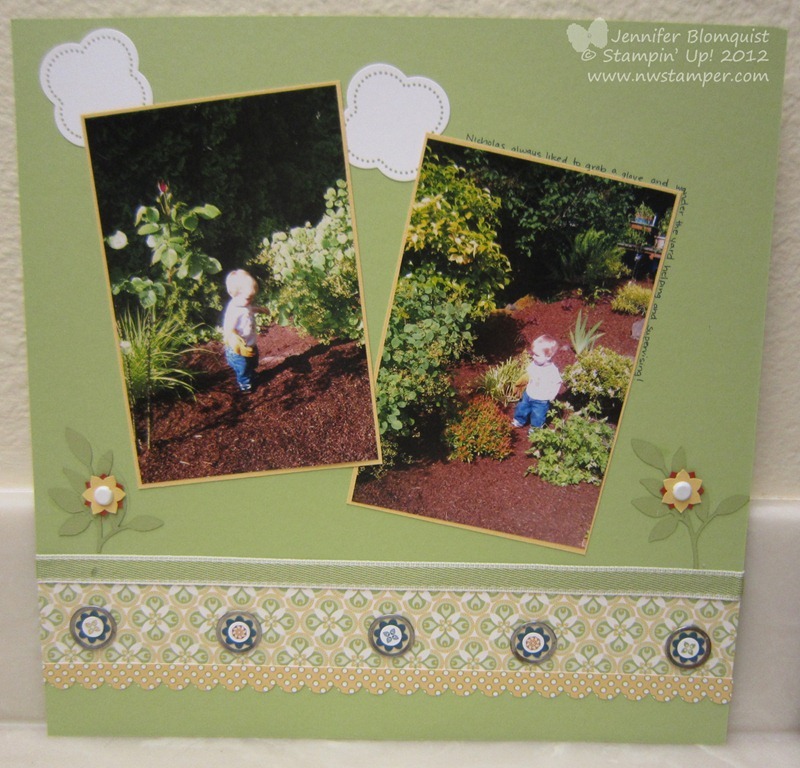 Click here to learn more about my Cards To Go kits. Want to come to one of my next classes? Check out my calendar and let me know! Have you ever looked at your stash of supplies, whether scrapbooking paper or office supplies, and realized you had more than you thought? That was me after organizing my craft room at the end of last year. 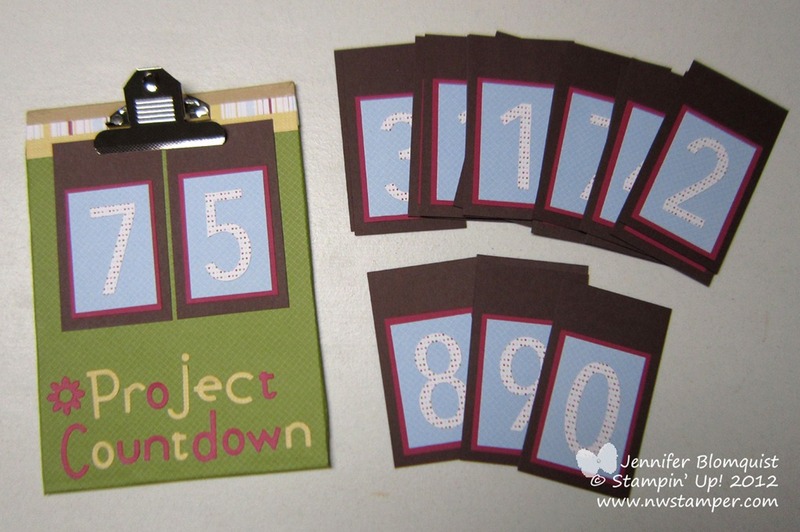 So I joined a group of girl friends in declaring a 100-project challenge! 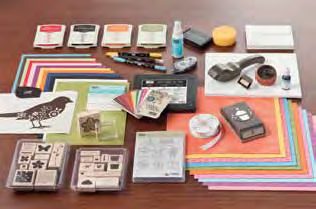 For this challenge, you are supposed to create 100 projects using the supplies you have before you buy more stuff. You are allowed to declare exceptions – like I said I could get more adhesive, supplies for my Stampin’ Up! classes, and page protectors for scrapbook albums. 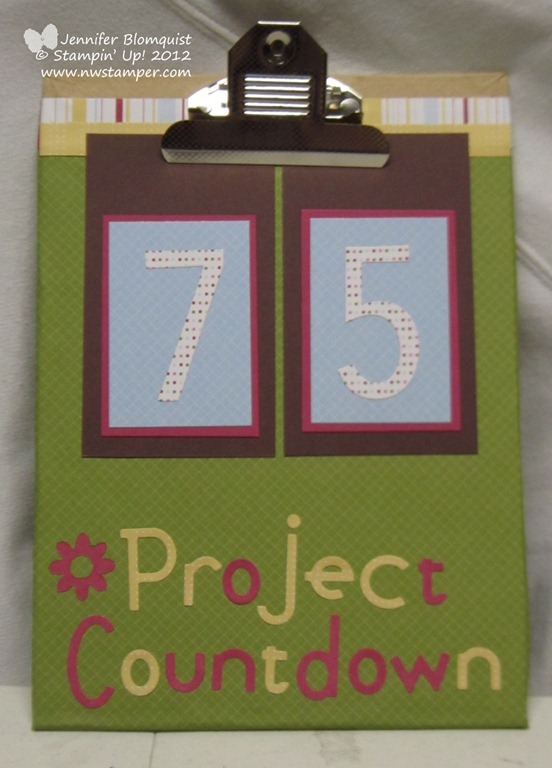 However, soon after starting the challenge, I realized I was having a hard time remembering what number I was on, and so I decided to make myself a little countdown ticker. I found a smaller clipboard at a local craft store for $1 and so I snagged it and brought it home to decorate – hey it counts as one of my projects that way! I dug into my retired designer paper and found that I had tons of this Junior Varsity pattern and so grabbed a pack and got to work. I covered the front and the back of the clipboard with designer paper and then used the Big Shot to cut out a title using the Go Go Boots alphabet dies I got on the Clearance Rack. Then for the numbers, I used my Simple Numbers Bigz die to cut out two sets of 0-9 numbers. Then I created cardstock tags that could be clipped up and traded out as I worked my way through my projects. Don’t Miss The Sale-a-Bration Savings! Well, we are about halfway through Sale-a-Bration and I wanted to make sure everyone has been having a chance to take full advantage of all the great deals! Whether you are looking for a fun business opportunity, just want your favorite supplies at a 20%+ discount, or really want a killer deal in the form of the starter kit…now is the time to go for it! There is no obligation, just lots of cool stuff! So, what do you get? It is a $345 value for normally the cost of $175 – but thanks to Sale-a-Bration it is $50 off! That is $345 worth of supplies for only $125! Perfect for beefing up your supplies or plenty to get you started. You can see the detailed list of everything that comes in the kit here. Get a free pack of designer paper (your choice!) or a free digital download every month for the rest of the year! So, lets say that you signed up today. You would get up to 10 packs of designer paper for free over the course of the year. And the benefit to delaying getting the paper over time? You get to pick free packs of paper from the new catalogs as they come out! That makes it $455 worth of supplies for only $125. Sweet! Anyway, while I’m sad I can’t sign up again to get the killer deal, I’m super excited to share the opportunity with you. So, if you’ve been thinking about signing up or are just intrigued about this deal, let me know and I’d be happy to talk to you more about it. Email me at jennifer@nwstamper.com. You can get started online and take advantage of all the benefits almost immediately. Plus, if you decide that you don’t want to do anything as a demo after you sign up… that is OK too. 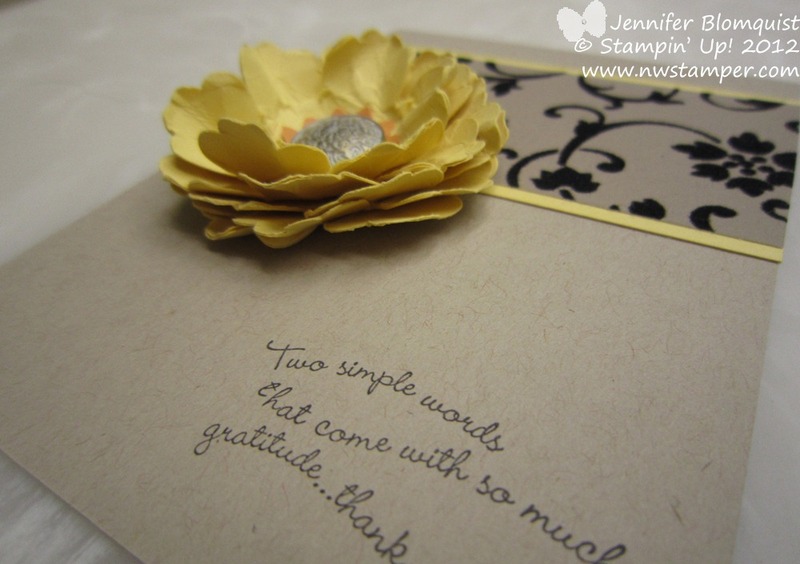 There is no obligation, just enjoy the monthly magazine and inspiration available to demonstrators by Stampin’ Up!. I love how it turned out and while I know I’m going to have to CASE it and make one for myself, I wanted to share it with you today. 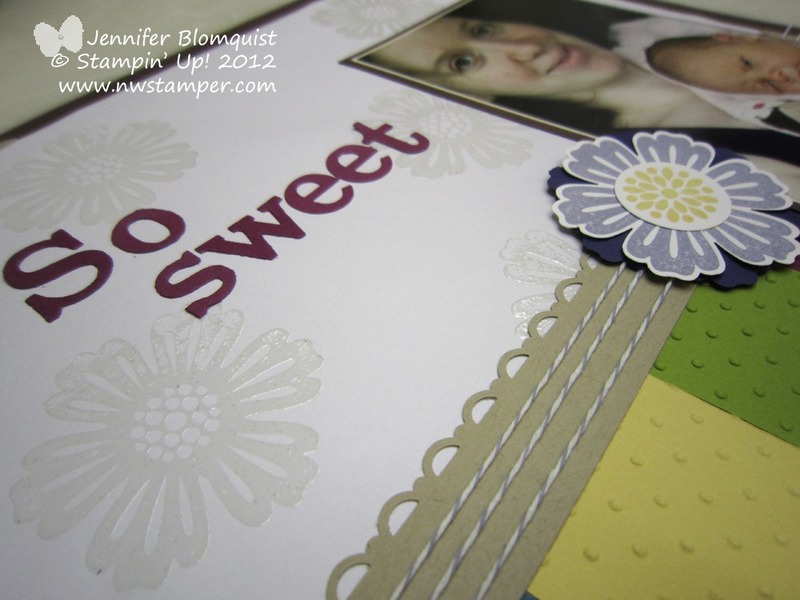 I love how she used the Fresh Vintage stamp set to make a band for the smaller of the two Labels Framelits and then used the Bouquet Blossom Triple Layer punch for the central flower. Finish it off with the uber cute Everyday Enchantment brad from Sale-a-Bration and it really pops! 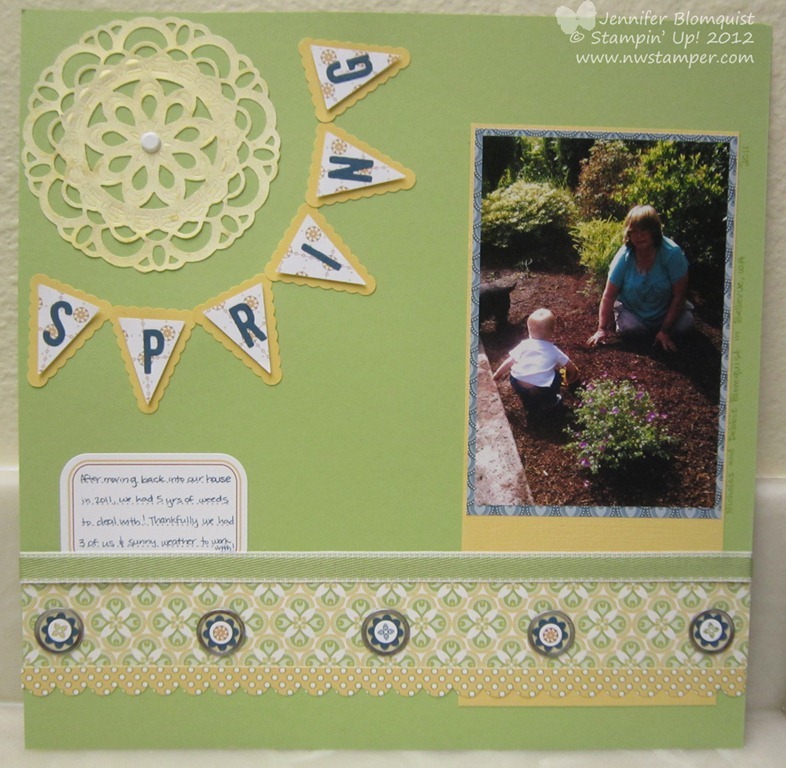 So, thanks, Pam for sharing this card with us and I can’t wait to go try it out myself! The sketch had you putting a banner in the upper left corner and I decided I wanted to say “Spring” which ended up leaving me with extra space to fill. I just happened to have a doily cut out using the Paper Doily sizzlit and so I spritz’d it with Gold Smooch to match the colors and turned it into my sun. I forgot to mention that I was once again pulling out my Country Club Simply Scrappin’ Kit so the colors and the designer paper all came from this kit. It also had these white rounded corner stickers that I started to pull off for journalling when I realized they would be perfect as clouds! I love the touch of whimsy they give this page in real life. I thought I’d point out the last two fun elements that I added to this page to help give it some pop and fill some space. First are the flowers I added next to the pictures. I had originally planned to use the Boho Blossoms punch to make flowers to use along the designer paper at the bottom of the page but changed my mind. 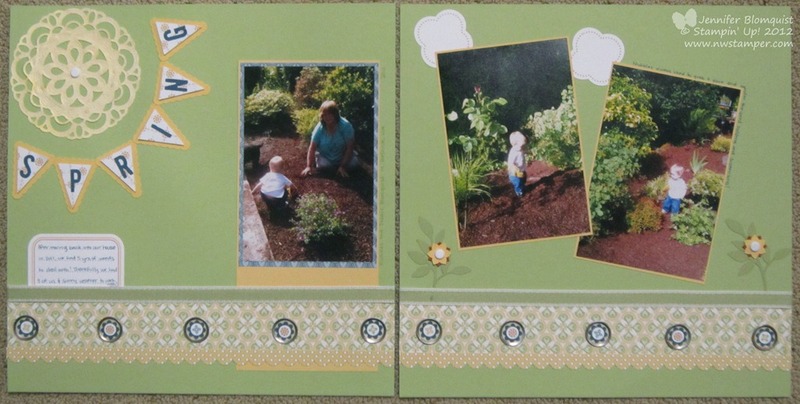 So, I had extra punch outs that ended up going perfect with my garden theme. Then, instead, along the bottom of the page, I grabbed my Vintage tags and snipped off the hanging thread. Then I filled them with a punch flower from the Boho Blossom punch in Not Quite Navy and then added a central image using some of the stickers from the Simply Scrappin’ kit. All together, they actually were pretty quick to put together! They may look a little bare compared to some of those super fancy scrapbook pages out there; but I love how it turned out in real life. Plus, now I’m 3 more pictures done in my backlog of printed photos to scrap!